If you are like me, you said, "That is NOT the Harlem Shake" after seeing these viral videos of kids just flinging and flailing their arms claiming to be doing the Harlem Shake. I didn't even look at an entire video. The little that I saw was a turn off because it is NOT the Harlem Shake! Well Melissa Harris-Perry took it on the topic and set the record straight. I am so glad she did. I didn't see MHP's comments but it's interesting to me how people incorrectly assume that the new videos purport to be doing the Harlem Shake dance. That's simply not the case. Harlem Shake is the title of the song heard in the background of the new videos and that's it. The reason why Harlem Shake is the title of the song is because a character in the song lyrics at some point does the REAL Harlem Shake. What we are seeing in the new videos is a reenactment of a real REACTION of a guy and his friends when they first heard the song. 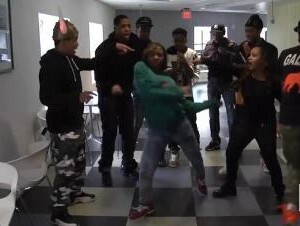 Trust, no one is confusing this reaction to the song with the REAL Harlem Shake. Furthermore, those who started making the videos in the very beginning labeled them "Harlem Shake v.2". Blame the general idiot masses who followed for not keeping up with that citation of attempted clarity.